Sequans on track to deliver the first commercially available LTE Cat M1/NB1 chip for network deployments beginning in Q4. Leading LTE for IoT chipmaker Sequans Communications S.A. will demonstrate the world’s first LTE Category M1/NB1 chip at CTIA’s Super Mobility Week, September 7-9 in Las Vegas. Named Monarch, Sequans’ newest chip, the world’s first purpose-built and most highly optimized Cat M1/NB1 chip, will be shown in live communication with an LTE eNodeB (base station) emulator, the Amari OTS 100 from Amarisoft, in Sequans’ meeting room. Monarch is an LTE Cat M1/NB1, LTE Release 13 solution. It is designed specifically for narrowband IoT applications, including sensors, wearables, and other low data, low power M2M and IoT devices. Monarch complies with the ultra-low-power and reduced complexity feature requirements of the 3GPP release 13 LTE Advanced Pro standard, defining narrowband, low data rate LTE technology for machine type communications. Monarch is the industry’s most highly integrated Cat M1/NB1 chip, whereby baseband, RF transceiver, power management, and RAM memory are integrated into a single, tiny 6.5 x 8.5 mm package. In addition, Monarch supports advanced features such as programmable RF filtering for global band support in a single SKU, and proprietary dynamic power management technology for operating life of 10+ years. 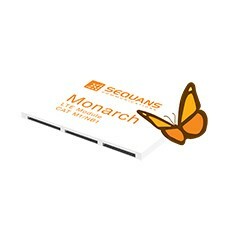 “We are very proud to highlight the key capabilities of Monarch in this first-in-the-industry live demo of a Cat M1/NB1 chip,” said Georges Karam, Sequans CEO. According to ABI Research, a leader in technology market intelligence, cumulative cellular M2M module shipments from 2016 through 2021 will reach 1.1 billion units; LTE modules will experience the highest growth, exceeding 50 percent of all cellular M2M shipments in 2021. “Narrowband LTE technology is of crucial importance to the M2M and IoT markets as many use cases will require nation-wide and carrier-grade connectivity. Our Monarch chip is an ideal solution to address this demand,” said Karam. The Monarch demo will be shown to interested parties at Super Mobility Week by appointment only, September 7-9. * Cat M1 and Cat NB1 are the new narrowband categories in Release 13 of the 3GPP LTE standard, recently published, that specifically defines LTE for use in low data rate and low power IoT and M2M applications. Two new narrowband categories have been defined: 1) Category M1, also known as LTE-M and Cat M, delivers about 1 Mbps maximum in a 1.4 MHz channel, and Category NB1, also known as narrowband IoT, or NB-IoT, delivers about 40 kbps in a 200 kHz channel.